Unique concept, design, and technology help an artist re-imagine the past. An art / tech riddle: What has traveled to more than 15 countries, retained its inherent structure, yet changes appearance and presentation each time it is seen? The answer: renowned artist Isaac Julien’s epic nine-screen multi-media installation “Ten Thousand Waves,” receiving its U.S. debut in NYC’s famed Museum of Modern Art. Powered by nine Christie M-Series three-chip DLP projectors, this “site-specific” piece is a unique medley of film (satellite, super 16mm, HD green screen recreations of Maggie Cheung portraying the Goddess Mazu) and sound (original ambient score with contributions by Jah Wobble, the Chinese Dub Orchestra, and Maria de Alvear). The concert of audio and video configured in an organic circle help tell the story of the 2004 tragedy in which 23 Chinese cockle pickers drowned in England’s Morecambe Bay. Beyond the atrium, the exhibit can be seen and heard from a number of angles, including pockets of vantage points from the Museum’s six floors. Building on the infinite viewing configurations is the added element of double-sided screens made with material that allow equally bright images on both sides. To achieve this level of specificity, the Gerriets frames (GAMMLUX for the largest, EVEN for the rest), designed by Neal Wilkinson, had to be custom-built from extruded aluminum. Isaac Julien. "Ten Thousand Waves." 2010. Nine-channel video installation (color, sound). 49:41 min. Installation view at The Museum of Modern Art, November 25, 2013–February 17, 2014. The Michael H. Dunn Memorial Fund. The Museum of Modern Art, New York. Photo: Jonathan Muzikar. Also groundbreaking is the technology itself, some of it just off the shelf, including the d&b Speakers (Models 4S, 5S and 12S). How new are they? The AV team had only demo models to work with in the earlier stages of the design, with the final order arriving about a week before the installation. In a "Behind the Screens" post, Martin Hartung, MoMA's Curatorial Assistant, Department of Media and Performance Art, stated: "These speakers cut out ambient sound and are designed to prevent sound from leaking into other parts of the Museum. The special challenge for Jamie ['brilliant' sound designer Jamie McElhinney] was that the piece’s elaborate soundtrack needs to be equally audible from each screen, as the audio travels from screen to screen throughout the piece." In addition, Hartung said that a hearing loop was installed under the floor to provide high-quality sound to anyone who has a hearing instrument or cochlear implant with an active, manually accessible, t-coil. 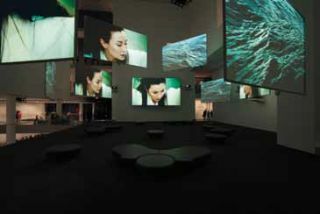 Eight Christie WU14K-M WUXGA DLP projectors and one Christie HD14K-M 1080 HD DLP projector were selected by the artist, MoMA’s AV Team, and Christie partner Michael Andrews Audio Visual Services (MAAVS). MoMA Audio Visual Design Manager Aaron Harrow cited Christie’s reliable local support as an integral factor for projector choice as each “Waves” exhibit, wherever it travels, relies on its own in-house AV setup. “We have a relationship with Christie already, they have always been there for us,” Harrow said. “We do a lot of large special events [such as Christian Marclay’s “The Clock” and the Kraftwerk Retrospective “1 2 3 4 5 6 7 8”]; Christie’s always our ‘go-to.’"
Lighting-wise, there are a limited number of heavy hitters capable of producing the kind of HD projection and lumen-count necessary for the naturally lit open space that is the historic Atrium. “I basically started out with lumens; we knew the first battle was fighting ambient light in the space so I knew we were looking at 10,000 plus. In the world of projectors that puts you in a certain zone,” speaking to Christie’s reputation for sheer high-end projecting power. The challenges of staging an exhibit of this magnitude also involve structural integrity considerations. Inches matter when the decision to hang one of nine screens and nine projectors higher or lower means changing the location of the other pair of eight. Though the piece was acquired last year and planning had gone into effect shortly thereafter, in terms of turnaround the AV team had only three weeks between exhibits. “We hit it pretty hard,” Aaron Louis, Director of Audio Visual, confirmed. To say that both the screens and the projectors each presented their own set of challenges is an understatement. Martin Hartung also explained the need to “run tension wires across the atrium to hang (them).” Because the atrium’s central ceiling is not load-bearing, tension cables had to be installed between the upper walls in order to hang the screens in their desired positions. As if that weren’t enough, 300 pounds and 400 feet of heavy cabling material needed to remain out of sight to the viewer. There may no wrong way to view “Ten Thousand Waves,” but we’ll let you in on an insider secret — consensus among the AV team is the middle of the atrium is a favorite viewing spot. Isaac Julien’s "Ten Thousand Waves" runs in The Museum of Modern Art’s Donald B. and Catherine C. Marron Atrium, second floor (and beyond) from November 25, 2013 through February 17, 2014. Visit moma.org and www.victoria-miro.com for more information. All imagery: Isaac Julien's "Ten Thousand Waves" at The Museum of Modern Art, November 25, 2013–February 17, 2014. The Michael H. Dunn Memorial Fund. The Museum of Modern Art, New York.